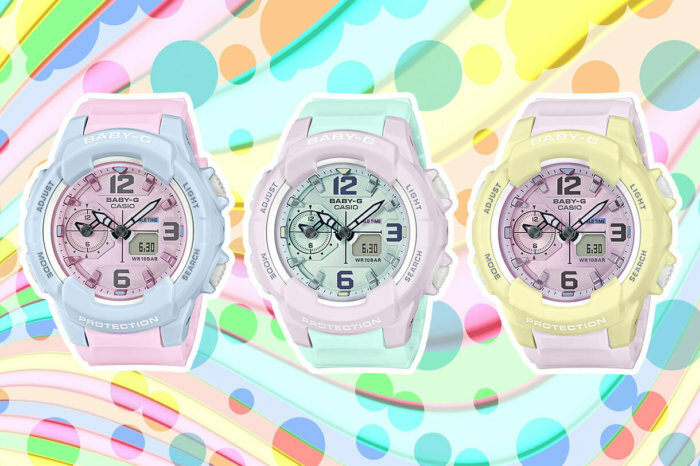 The Baby-G BGA-230PC Pastel Color Series is a March 2019 release in Asia and North America. Models include the BGA-230PC-2B (blue bezel, pink band), BGA-230PC-6B (purple bezel, green band), and BGA-230PC-9B (yellow bezel, purple band). The rugged, masculine-style case combined with soft pastel colors creates a unique street style. With its dual dial world time, the BGA-230PC is also a capable watch for traveling. Features include shock resistance, 100-meter water resistance, world time (48 cities + UTC), 1-second stopwatch (max 59’59), countdown timer (max 60 minutes), daily alarm, full auto calendar, and LED light with afterglow. The watch measures 48.9 x 42.9×15.3 millimeters and weighs 46 grams.